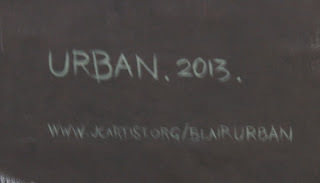 Blair Urban participated in the Art Activates Alley MuralProject blogged about here. Her website is here. 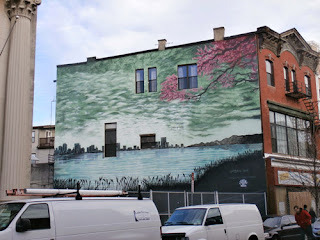 She painted this water/sky/earth/city mural on Newark Avenue. Seeing bodies of water always induces a kind of dreamy tranquility. All rivers run into the sea, yet the sea is not filled says Ecclesiastes, a line I never tire of quoting. Murals recently popped up on buildings throughout Jersey City, a city-sponsored project that I am still catching up with and that brought together bare building exteriors with artists and making available municipal cherry-picker vehicles so artists could reach the heights necessary to make their vision a reality. 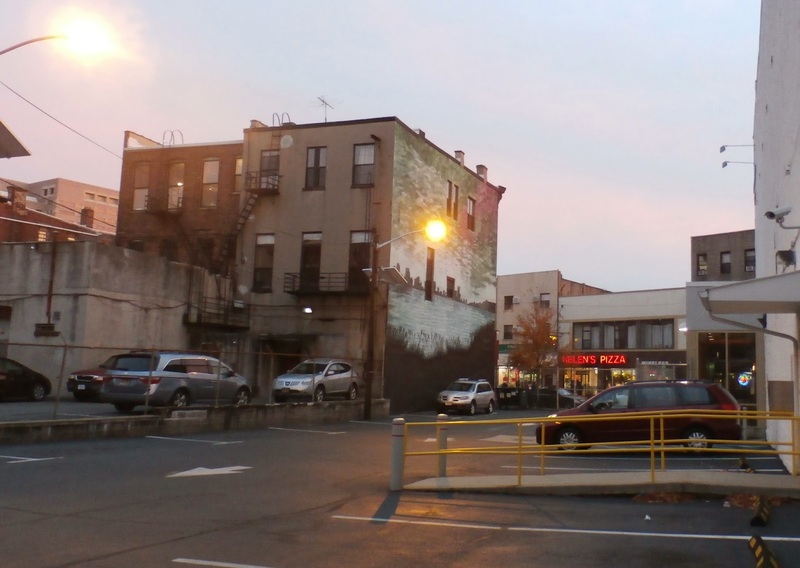 This vast uncanny, deceptively realistic mural is on the western side of an edifice on the northern side of Newark Avenue. 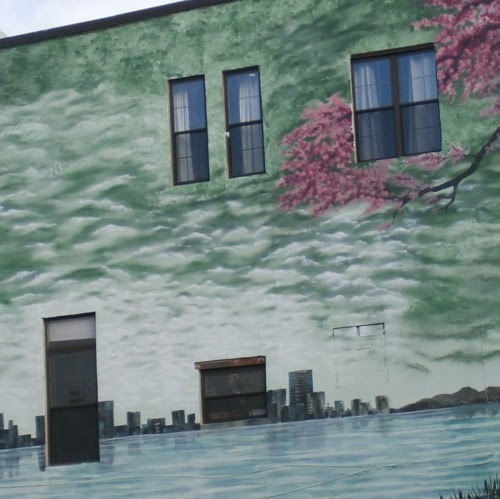 Water dominates the image, that substances that covers most of our planet and from where our protoplasm-souls crawled out to evolve into our now urban-souls passing by this mural that demands to be noticed as go to work or love during what we call linear time. 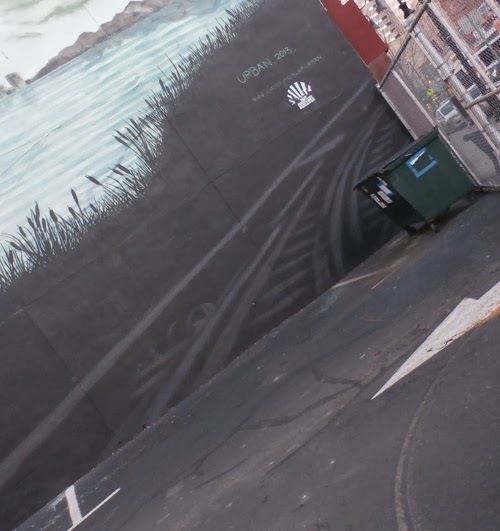 The water is forefront, yet is essentially blank, a simple suggestion yet lots of room for our minds to freely roam, lots of a sort of nothingness as the obvious focal point, which is clever in and of itself but then nothing about this mural is obvious. It’s not just water but also the equally blank sky that occupies its center-point, a seemingly lack of detail compels our attention, just like looking at real water and seeing the empty sky as your field of view expands seeking the horizon. That horizon though is a city, the geometric skyline of rectangles, a far away life we assume is more exciting than ours. The foreground is lonely but just as crucial in the framing of the central liquid/sky emptiness – a thicket of tall marsh grass, gently swaying in an invisible breeze. In one corner (often a car is parked here, dammit!) are faintly visible railroad tracks. 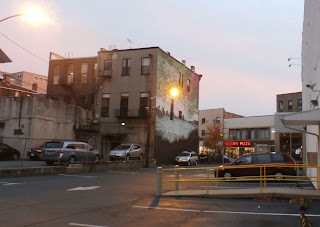 In the upper corner is a branch, reddish-pink leaves – we’re in forever autumn and where we are sitting we see the city but also another similar shore to the one we where we now sit, stark and rustic and definitely not urban like our horizon that divides the greenish, overcast sky from the bluish water. What a subtle yet astonishing artistic choice – the sky has a hue of a water, the water the hue of sky, each reflecting the other. Then you realize, this setting pictured on the wall is a place in Jersey City, the fading tracks are those abandoned Central Jersey Line, unused for more than half a century, those vestiges of our nation’s glorious railroad past, you see along outlying inland areas of Liberty State Park, where closes to Hudson bay there are stretches of grassy shores, from which the view contains both Manhattan and Bayonne, the other rocky inlet. 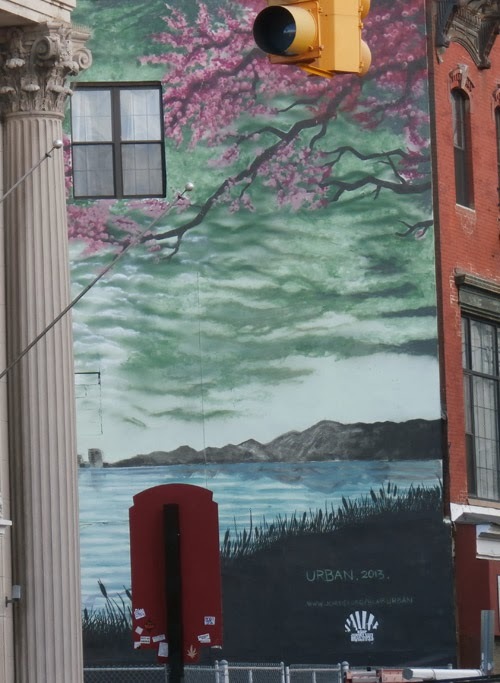 This mural depicts the view of we looking out from our Jersey City Isthmus. 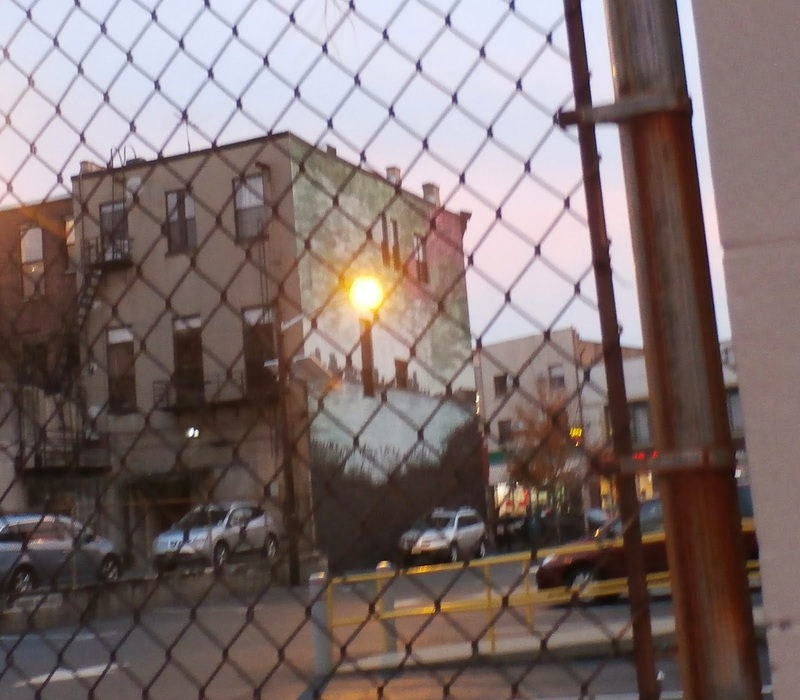 What is seen tells us as much about who is doing the seeing as it does about the physical visage that is viewed. 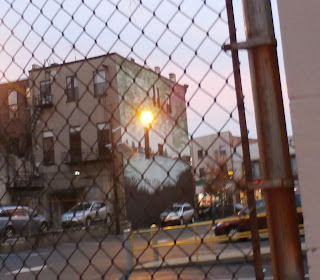 Then we get to the windows, the actual real windows of life as we know it on this building that now and before this painting was a building doing what a building always does, housing occupants for whatever reason its occupants require this housing. The object is as indifferent to the art as the art is to what it depicts and the feelings, thoughts and notions that depiction invokes in those who see it. 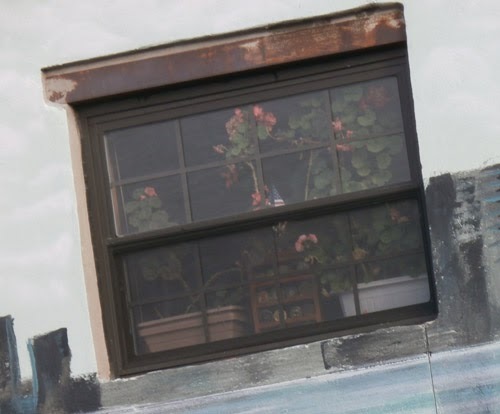 Here, the artist uses these windows as part of her expression. 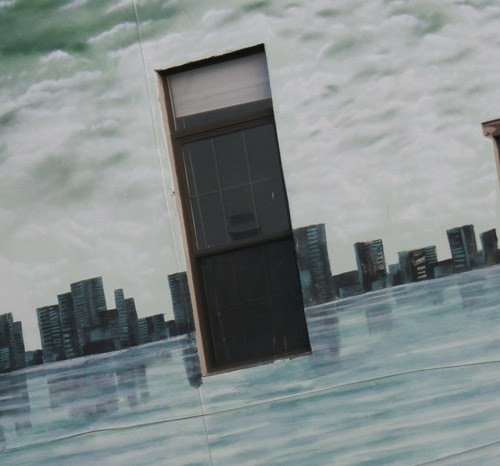 She doesn’t avoid them or ignore them, she seems to paint around them but in such a way that the windows become surrealistic entities within this watery pastoral of sky and shoreline and distant city. They recall Salvador Dali as they give us an interior doubt that protests against our acceptance of an unqualified faith in the ultimate truth of an exterior reality. The windows have a functional purpose for the building, but the artist incorporates this medium in her message. They are transmuted from functional to the aesthetic, they now seem designed into the whole of the visual. 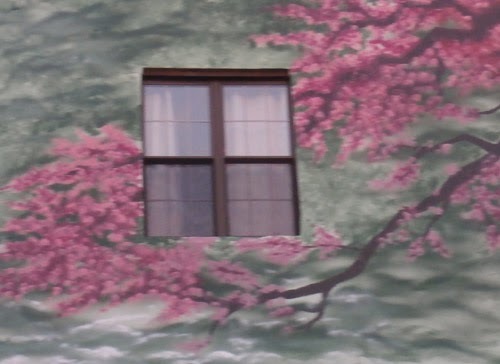 It’s as if the windows only exist because of this painting. The windows new reality is for us to ponder our own assumptions of what is real. Windows show us things we would never otherwise see, but those places are where we happen not to be. Whether we hope to go there or whether seeing the distance makes us happier with where we are has nothing to do with the window, and ultimately more to do with us – and the unknown future that is part of our burden or mortality – than the there in the distance. Windows show us where we are not while also reminding us we are where we are. The Windows float in the sky, are incorporated in the city skyline and as part of a distance imaginary heavens above a city of buildings. The windows allow us to dream away the loneliness of the tall grass and tree and abandoned railroad tracks.